NOTE: THIS TASK IS NO LONGER AVAILABLE IN GAME. For an overview of Veil of Alaris pre-launch events, see this quest entry. This is a pre-launch group mission leading up to the Veil of Alaris expansion, expected to be available only for a certain period of time ahead of VOA's launch. There are two versions of this task: One for Level 90s and another for lower levels (only differences are in mob difficulty and reward quality). The Level 90 version of this task is of Tier 4 House Of Thule difficulty. NOTE: To get the Level 90 version, your group's average level has to be 90 and a Level 90 player has to request the task. To get the lower level version, your group's average level has to be below 90 and a lower level player has to be the one to request the task. For a map of the instanced zone and important locations, click here. Mechanic Elroy Gearstripper gives the task. He's found at the work site in the far southeastern part of the Steamfont Mountains at location -1410, -1500, 4. You have been assigned the task 'Engine Trouble'. Mechanic Elroy Gearstripper in the Steamfont Mountains has a problem. He sent his assistant, Bizlo to the Plane of Innovation to gather some parts to make the engine for the blimp, but he hasn't returned yet. Elroy has asked you to find him. You have entered Plane of Innovation. Task Window Says: Find Bizlo in the Plane of Innovation and speak with him. This won't be too difficult as he's right where you zone in. NOTE: This task locks once you turn in the sixth crystal. The above six steps open one at a time, so you'll have to do the turn-ins in order. The first console is in the first room north of the zone-in. From there, you'll make your way around until all six have been done (consoles will be marked on your compass). Crystals drop in bulk from the clockwork golems and security bots in the zone. The clockwork golems hit for a max ~8,400 and are mezzable. Each security console is surrounded by 4x "a security bot". These are mezzable; splittable; not tethered; hit for a max ~5,000; and AE rampage. They have a lot of hitpoints compared to the golems and are fairly spell resistant. The first console is at location 290, 1445, 5 (northwest of the central room) and takes a red crystal. The second console is at location 600, 1130, 5 (northernmost console) and takes a green crystal. The third console is at location 300, 800, 5 (northeast of the central room) and takes a blue crystal. The fourth console is at location -285, 800, 5 (southeast of the central room) and takes a black crystal. The fifth console is at location -600, 1115, 5 (southernmost console) and takes a clear crystal. The sixth console is at location -255, 1455, 5 (southwest of the central room) and takes a purple crystal. You have successfully deactivated the security console! If you turn in an incorrect crystal, you'll just get it back. Task Window Says: Now that all of the security consoles have been deactivated, you are to find and destroy Rubbish Eater. Destroying Rubbish Eater will lower the final electric barriers that are blocking access to the rest of the Plane of Innovation. Rubbish Eater is found in the central room. Rubbish Eater's gears begin to whir, activated by your presence. It hits for a max ~8,900 and spawns waves of adds (unknown if timed or health-based): 9x "a rubbish seeker" in a wave (mezzable; stunnable; hits for max ~225). Rubbish Eater has been slain by _____! 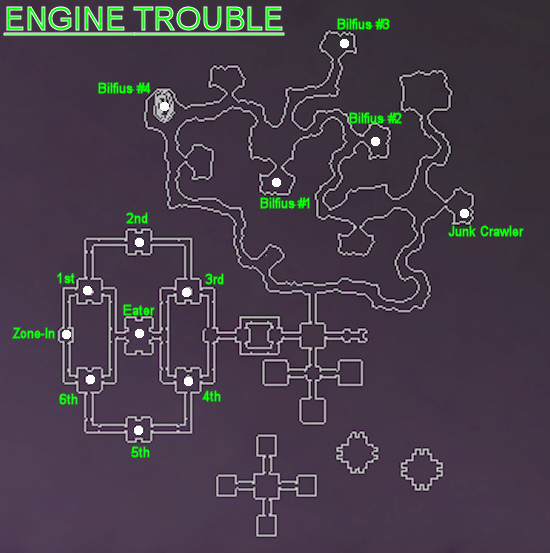 Your task 'Engine Trouble' has been updated. Junk Crawler is found at 775, -975 (in the easternmost dead end area). It hits for a max ~8,900. Junk Crawler scurries quickly towards you. Junk Crawler has been slain by _____! This is a common (but not 100%) drop from the mobs throughout the outside area of the zone. He's now found at 1500, 960 (inside the clockwork house in the northwest part of the zone). This, time you can kill him. NOTE: There are two clockwork devices outside the house that will aggro you if you don't kill them first. Bilfius Botsworth has been slain by _____! Did this last nite with mage, cleric, druid, enchanter, wizard, and wizard merc (all 90). Mage pet tanked. All players were max xp and max aa's (except the merc of course). Took 5 1/2 hours. No way anyone solo's this. COTH and Friendship fire do NOT work in this zone. Zone in and hail Bizlo. First part - there are 6 rooms with 4 large robots in each room that are agro linked. All con white or yellow. They are snareable and mezzable (although mez resists were common). These mobs have a TON of hp's (so we got a taste of what the new expansion mobs are like). There are also 2-4 trash mob robots in between each room that are typical white/yellow con mobs, also snareable/mezzable. In each room is a large machine which takes a certain color shard (these drop in abundance off of all the mobs in the zone). The rooms have to be done in a clockwise rotation starting from the zone in. Once all 6 shards are turned in, kill a Rubbish Eater (red con robot rat) in a room in the center of the 6 shard turn-in rooms. Easy mob, doesn't really do anything but melee. Go back to zi and hail Bizlo to open up rest of task. Next head outside, see map linked above. To get outside you must get past 2 sets of 3 Tin Soldiers that are aggro linked. These are yellow con, NOT snareable, NOT mezzable. We had the druid aggro all 3 and take off running while rest of group hid to the side. After he had run a good ways, he would egress. As the 3 mobs walked back to their spawn points, the group would pick off the stragglers. We would kill 1 , then 2 at once. Mobs were normal yellow con mobs hp-wise. Head outside and turn right (east). Clear trash mobs until you get to Junk Crawler (again, see map linked above). Loot Power Sources off of the trash mobs (you will need 20, almost every mob has one, and you will be killing a LOT more than 20). Kill Junk Crawler. The write-up above says he spawns waves of 9 adds, we never saw them, just burned name down and looted Large Metal Hull from him. Continue clearing trash mobs until you have a clear path to all 4 of the Bilfus Botsworth's spawn points (map). This takes a while, there are quite a few mobs (mostly yellow cons), and they usually come in pairs. FINALLY, attack Bilfus at his first spawn point (red con, but not many hp's, easy mob). He is snareable btw. At 75% he warps to his 2nd spawn point and spawns 4-6 large robot adds. Once he gets to 50% he again warps, to his 3rd spawn point - and spawns 4-6 robot rat adds. At 25% he warps to his 4th and final spawn point with no adds. Kill him and loot Huge Bundle of Scrap Metal. Return to zone in and turn in Huge Bundle of Scrap Metal, Large Metal Hull, and 20 Power Sources to Bizlo to finish task. Everyone in the group got 5 Work Vouchers. The chest only contained 1 An Ancient Tome range item, which will also give you the An Ancient Tome quest item if you equip it and click it. As I said , took us 5 1/2 hours, and we had decent dps with 2 wiz types. First portion of task with 6 rooms took an awful long time. Could probably speed the task up with a real puller (monk, bard, ranger). We were snare/egress pulling with the druid and that takes a little longer. Very few deaths, although we did all die right at the end when Bilfus spawned all those adds. We were not expecting them. My main complaint is that chest only spawns 1 Tome item. If you did not do the pre-quest for this item back in September or October, you will have to do this task multiple times to get everyone in your group the Tome item. Not many people are going to want to do this even one time, much less multiple times. Our group swore they would never return. 90 Enchanter and group did this today and chain stunned Bilfius so he didn't warp at all. Group killed him at his first location and looted A Huge Bundle of Scrap Metal. Group avg was lower than 90. We had an 86 rogue in group. I tried to get this mission with a group average of 81 -- and tried on all three characters to say ready and he only says "this is a dangerous area, beat it before you get hurt." Solo'd as a 90 mage 4kAA.. took all 6 hours. You dont need 3 people to start mission. Solo'd as a 90 mage 4kAA.. took all 6 hours. You dont need 3 people in the group to do it. Requested mission with my 85 rog. and confirm Ancient Text in chest upon completion.. Others in group were lvl 90 and reported mobs were lower con then a full grp of 90. Completed in about 2.5 hrs..
No respawn in this instance. Mobs do not see rogue SoS. There are a few clusters of tin soldiers in the way but they are immune to both mez and root, so if you can't split them you might get past by training them off to the side. The reward also gives you a piece of lore for the VoA expansion that I think I read it gives you a small advantage in faction/language for the new expansion. Yes, decent range item, An Ancient Text, will give 5% of the new language. Once have Text clickie it will get you another text, once VOA goes live, clickie that to get 5% into new (non-player learnable) language. It required to be able to get the new set of AAs. Only one person gets the Ancient Text. Just did this with a group of guildies. Two of us had already done Baga's Stand, so had the Ancient Text and the 5 points in Alaran. We had done that quest together, and every person who did it got the reward. CoH does not work here. The mobs have a gazillion hp's. You could mez some, not others. Some saw invis, some didn't. So we decided to just knuckle down and fight our way through everything. However, in this quest, which was painfully slow, we were dissapointed that there was only ONE Ancient Text in the chest at the end - 3 in our group needed it but only one could get it! Oh well, guess we need to run it again a few more times so everyone who wants one, can. I just tried to get this with 5 90's and an 80 which brings my average to 88.3 and it says that my level average is too low. Edit: Had the level 80 just say "begin" to get the task and it worked. Try having the lvl 88 request the task. Thanks! I had 5 level 90's and Elroy wouldn't speak to the level 80 so I just cheated and said "begin" on the level 80 and I got the task. Everyone needs to be level 90. Otherwise get the other task (have the lowest level toon request it). We had a full group, 5 level 90s and a level 89, could not get 89 in. When we finished this task, we found An Ancient Text in the chest. The same you recieved on the mission Baga's Stand. Expect to take three hours to do this mission. nearly everything in here is CCable, and able to do be memory blurred, so there is the option to attempt to bypass most of the mobs.